Gardenias are beautiful, delicate flowers, popular for use in weddings and as floating water blooms. They are delivered to you straight from the farm. Choose from a limited quantity of stems or in bulk for even higher per stem savings. They are available year round. We recommend that you schedule their delivery 1-2 days prior to your event. It is also recommended that you order them at least one month before your event to ensure availability from our farms. Once you come to the understanding of the beauty and brilliant imaging of this lovely wholesale flower, you will soon recognize that you don't have to be a Gardenia Florist to fully appreciate and handle this very special variety. At one of our choicest farms, it is grown and bread for its beautiful foliage; it is truly an intriguing fresh cut flower. It is strongly scented, making it more than just a visual beauty to adorn a bride on her wedding day. This variety is named after Alexander Garden, a Scottish doctor. He was also a botanist who lived in the mid 18th century and harvested them for medical purposes. It is also noted the France is particularly fond of them and the men there traditionally wear them as boutonnieres. 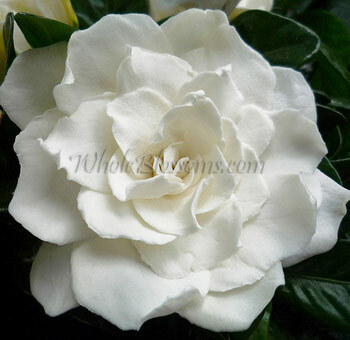 Gardenias are very fragrant with a creamy white tone and glossy, dark green leaves. They can be solitary of found in small clusters of white and pale yellow. They are chosen by brides all over the US and Canada, but seem to be specifically created for Southern brides. They have some fanciful ways and traditions, so it would be surprising that many of them choose them for their own wedding flowers. One bride described them as, "A snowy white bloom, glossing evergreen leaves, and an intoxicating fragrance, making it a natural choice for arrangements." It's important to note that their fragrance is quite strong indeed and better make sure everyone in your wedding party can handle it. You may also want to keep in mind that they are also somewhat fragile, handling them too much can turn them a little brown, so please use some caution. Many of our wholesale flowers have several color varieties, but gardenias are generally the same snow white color with a hint of yellow as they begin to age. They are a very good option for the all white wedding in which purity and honor are the telling tale of a bride’s story told. There is nothing quite like a White Gardenia Blossom, as it will be remembered for beauty and fragrance. It has a way of sweeping you like the wind over a fresh prairie. You may be stranded in the middle of the desert, but you fly high in the air with wings to the most amazing garden paradise with gardenias. Nothing in this world is limited with imagination and if you are considering some ways of using gardenias at your wedding or event, you will not be able to get enough of them. You can create a floral footsie. It is truly universal that a woman can never have too many pairs of shoes in her wardrobe or closet. It is the same thing with using floral accessories. You can jazz up your heels by creating flower shoe clips with gardenias. Not only are they stylish, your feet will smell good too. You may try decorating the backs of chairs with them. You can really sit pretty and make a wonderful statement by showcasing your Wholesale Flowers. If you are on a budget, simply decorate the bride and groom’s chair for dramatic effect. Try decorating the top of your wedding cake. A wedding cake topper will look so amazing on a white cake, or even a different color cake for contrast. If you are having an outdoor wedding, you may try decorating a swing. Bridges, gates, and swings can create romantic settings for photographs, so scout around your venue’s garden to uncover its unique features. Create some focal points for some incredible photographs. If you have hired some musical talent for your wedding, you might consider a wildly romantic piano arrangement. It may be just for show, but it will create a grand display using various props at your venue. It will be low-budget music to the bride’s ears. How about a trunk show? Whether you are arriving by classic car, horse, or stretch limo, your wedding wheels are the perfect place for a striking showcase. Use gardenia blooms and plenty of foliage to create a display which won’t get lost against a vehicle backdrop. Another consideration is max out your flowers with a stunning floral arch. At a church setting, look out for tapered doorways to decorate which already feature an arched shape. Free standing arches can be created for civil ceremony spaces and these can be as simple or elaborate as you like. If you are including your special fur babies in your wedding, which is now becoming more and more popular, you may consider a dog collar. Your best friend deserves to look dapper on the big day too. If involving your pedigree chum in the big day, ensure they took part with a statement gardenia attached to their collar, or try a hardy foliage wreath. Finally, another idea you may consider is to make a petal pendant. Flower loving brides could choose to carry a bouquet or wear a floral crown, but now there is a third option: swap jewelry for a natural necklace of fresh petals. These can be worn as well as, or instead of, a bouquet. You may also consider including many other varieties when creating bouquets and centerpieces. There are many complimentary choices, such as roses, carnations, stock, dahlias, hydrangeas, ranunculus, peonies, sweet peas, lisianthus, wax flower, calla lilies, cornflower, sunflowers, and so much more. Look no further, please browse our website and read about the many options you can choose from. We have over 2,000 varieties and adding more and more all the time. We hope to meet your need and far exceed your expectations. We are in the business of helping brides get the best flowers in the world and assist wedding planners and event planners in get quantity, quality and wholesale price. You will notice as you select from our many options that your imagination can run wild. Our Gardenia Delivery is straight from the farm and right to your door.